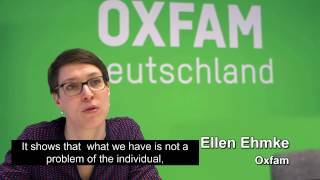 Appeal of Oxfam to support the film "Marketable People"
We are making the film „Marketable people“ because we all isolate ourselves more and more, and are determined by competition with each other. Anyone has all the possibilities open to him if he can only assert himself. This is sold to us as increased freedom. In actual fact however it is only ruinous competition in which we loose more and more protective rights to a good life and a future, while the bonds of solidarity disappear. It is an essential feature of this era, that we are all increasingly ready to give our utmost. To show ourselves in all circumstances to be creative, flexible, independent, risk conscious and customer oriented. Fear however is more present then ever before. Because if we fail, we always blame only ourselves. Unemployment, low wages, poverty, career decline and poverty in old age are seen by most of us as a personal failure. Which it is of course often not. Even when we are occasionally successful, we are immediately concerned about future failures. This uncertainty forces us to continuously self-optimize. Not all of us however can withstand this competition. And no success and no effort can ban the fear of failure. Some profit from this merciless competition. They are the owners of our debts. They get richer and richer without any achievement and competition. In the 200 year history of capitalism more and more fields of social life have been subjected to usage as a commodity. Right from the beginning it was the labour of humans that was used in the process of capital exploitation. In the labour unions, in sporting clubs and in a large part of one’s leisure time however it was possible to avoid the processes which resolved everything monetarily . It is only in the last 20 years that successively the whole person – even to his soul – has been made into a commodity. Recreational activities as well as Yoga, meditation, attention training and sport are all now a part of big business. A competition and money machine which runs day and night and around the world. In spite of these times in which everything is being monetized, increasing numbers of people are using a large part of their vigor for the opposite: Acts of solidarity and a sense of community. Whether it is open source programs such as „Open Street Map“, or „Foodsharing“,or Econony for common good, increasing numbers of citizens are looking for and finding activities which retrieve valuable areas of freedom from the world of business. Our film „Marketable people “ can only be created and distributed due to the thousands who support it without any remuneration. Should help, in a world where everything has been comoditized, to strengthen our solidarity and sense of community. Let us not sink into competition against one another, while the rich get ever richer and we get ever more defenseless and sold out to their interests. Democracy only has a chance when we realise our common interests and defend ourselves. The film „Marketable people“ will be a tool for achieving that .